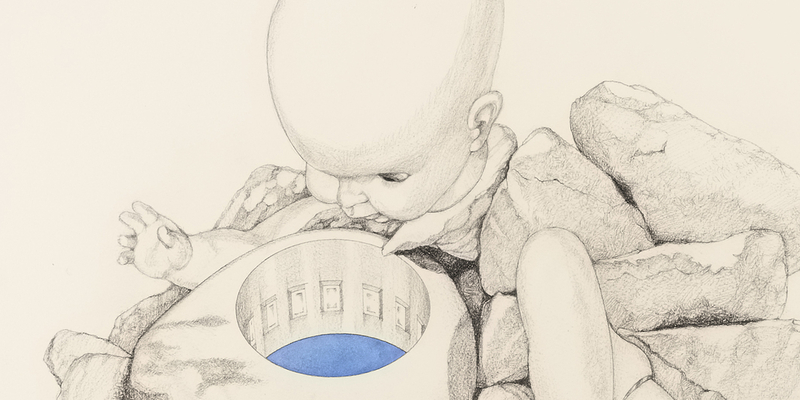 Minoru Yoshida, Space Doll, September 25, New York, 1974 (detail), 1974, graphite and watercolor on paper, 29 1/2 x 22". In 1970, Minoru Yoshida—already a rising star of the Gutai group—moved to the United States from Kyoto. He originally planned for a quick return but stayed in New York for almost a decade. In three video documentations of performances from 1976, on display here, Yoshida dons his “synthesizer jacket,” a sculptural garment that looks a little like a Plexiglas corset lined with circuits. Responding to the artist’s body and movements, the jacket emitted a variety of electronic drones—sounds that one could characterize as techno-bagpipe. In the video Absolute Landscape No. 3 (Psychic Revolution), 1976, Yoshida is balancing atop a precarious-looking abandoned building in Woodstock, New York. He resembles a 1950s B-movie astronaut or a male Barbarella. When he descends, two women join him, wearing silver reflective eye coverings and similarly futuristic-looking costumes. The extraterrestrial trio pour salt onto a vast roll of paper, making an assortment of shapes. Eventually, they light the tableau on fire. It’s a solemn yet trippy ballet. The group seems to deliver an indecipherable new message, à la the aliens in the 2016 movie Arrival. Immerse yourself in their trance. Yoshida the expatriate, dressed as an alien, plays with otherness. Two fabulous drawings are also presented here, precise renderings of a battered doll stuck into a pile of rocks (Space Doll, September 25, New York and Space Doll, October 6, New York, both 1974). We see the doll in the Woodstock performance; Yoshida briefly cradles it in his arms. These images are extraordinarily weird, a combination of academic draftsmanship and deep surrealism. Even though they were created more than forty years ago, they could have been made yesterday.